I wonder if Willie Wilson will pop some champagne during game six of the World Series tomorrow night when floundering Phillies slugger Ryan Howard inevitably flails at his next third strike like a drowsy man trying to kill a bumblebee with a sledgehammer. For twenty-nine years, Wilson has held the World Series record for strikeouts, with twelve, a record that Howard tied last night, in one fewer game than it took Wilson to amass his ignominious dozen. Howard’s record-tying failure came just moments after another World Series record was tied, the incredible, Pat-Riley-haired, oddly robotic Chase Utley matching Reggie Jackson’s exalted mark of five home runs in a single series. The adjacent placement of Utley and Howard in the Phillies batting order has to give a huge edge to Howard in the race to see which Phillie is able to set a World Series benchmark. It’s hard to imagine a scenario in which Chase Utley sees a pitch within several acres of the strike zone, what with the tall pile of swing-and-miss looming behind him in the batter’s box. Of course, Howard is no slouch, and there’s always the possibility that he’ll snap out of it. I am hoping that he does, and not only because I’m rooting for the Phillies. I have always had a soft spot for guys who go into huge, sad-faced slumps in the World Series with everyone watching. Baseball is a game of slumps and streaks, and everyone goes through them, but in the heightened atmosphere of the World Series these slumps summon the sullen gravity of tragedy, forever defining the poor mortal who has lucklessly stumbled into them. The first time I remember having a sharpened awareness of one of these slumps was in 1980, with Willie Wilson, who kept feebly waving at pitches all the way up until the final out, when his feckless lunge at a Tug McGraw offering sparked the first World Series celebration in Phillies history. Though in some ways Wilson will forever be frozen in that moment of futility, the truth is that he could never be frozen anywhere. The man is not known primarily for striking out but for his almost superhuman speed. Wilson, forever the fastest man in the baseball universe inside my skull, if not in the baseball universe itself, used that speed to keep running long after the 1980 series, playing for several more seasons, including a 1985 campaign that ended with Wilson performing well during the Royals seven-game victory over the Cardinals. He played for almost two decades in all, was a good hitter and a great fielder, and stole more bases than all but a few men in baseball history. Also, you could argue that he was the greatest hitter of triples the world has ever seen. First of all, he led the league in triples four times, more than anyone besides all-time triples king Sam Crawford, who also led the league four times. Also, the only player who ranks higher than Wilson on the career triples list who played as late as the 1970s was Roberto Clemente, and Clemente had 166 triples in 10212 plate appearances while Wilson had 147 triples in 8317 plate appearances. (If Wilson had kept up his rate of tripling and had gotten Clemente’s amount of plate appearances, he would have hit 180 triples.) Besides Clemente and the long-lasting line-drive smasher Stan Musial, all of the other players ahead of Wilson on the career triples list were done playing well before the color line was broken, and most of the massive triples-amassers did their damage in the years before the Ruthian era of the longball ensued. Why was there so much tripling going on back in the spike-gashing days of Cobb and Speaker? I understand why the dead ball reduced the number of homers, but I don’t quite get why it increased the number of triples. But whatever the reason, it was a lot easier to hit a triple when Honus Wagner ruled the earth than it was in the Age of Steve Balboni. A quick glance through my baseball encyclopedia shows that the teams Crawford played on hit on average (very roughly speaking) about 80 triples a year. Wilson’s Kansas City teams—despite playing in a relatively large stadium with Astroturf, i.e., a good place for triples—generally hit half or, at most, three-quarters as many triples per year as Crawford’s teams. In 1985, for example, the Royals hit 49 triples. Willie Wilson hit 21 of them! By comparison, when Wilson’s namesake, Owen “Chief” Wilson, set the single-season record for triples in 1912, with 36, his Pirates team hit 126 triples. 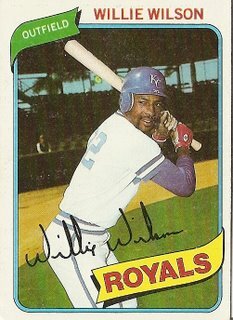 My math skills and handle on logic are laughable at best, but it seems to me that had Willie Wilson been on that Pirates team and carried the same proportional triples load that he did with the ’85 Royals, he would have finished the 1912 season with 6,847 triples. Well, maybe not, but I believe that had he played in the Era of the Triple he would now hold both the single-season and the career mark for triples, rather than just his soon-to-be-relinquished record for fanning in the World Series. In this 1980 card, Willie Wilson demonstrates that it’s possible to look fast even when standing still. Wilson epitomized the great Royals teams of the late ’70s to mid-’80s, even though he only became a regular in 1979, after the Royals had already taken three divisional titles. He did help them win the last of those three titles as a 23-year-old bench player unleashed in close games to unnerve the opposition with his alarming speed. The first time I became aware of him was while listening to a game at my aunt and uncle’s that year. The Red Sox had been mutilating everyone in their path, but as usual they seemed to be having trouble on the fast artificial turf in Kansas City. While the Sox always tried and failed to muscle home runs out of the sparkling, spacious facility, the Royals bunted for hits, executed double steals with swat-team precision, and slapped clutch triples into the gaps. Even before Wilson’s arrival, the Red Sox’ attempts to subdue the Royals often resembled a weary gorilla throwing uppercuts at a battalion of malarial gnats. And in that game in 1978, maybe because I was listening to it and not watching it, radio allowing for the wider horizons of folklore, Wilson seemed not so much a promising prospect as a perfect essence of Royalness, the sum of the happiest baseball dreams of Freddy Patek and Amos Otis and Hal McRae. He entered the game as pinch-runner when the outcome was still in doubt. The announcers, Ned Martin and Jim Woods, instantly began speaking of him in almost hushed tones, and Wilson obliged their fearful and laudatory testimonials by stealing second, sprinting to third on a groundout, and flying home on a popup to shallow center by The Next Mickey Mantle, Clint Hurdle. Not incidentally, in retracing the details of this 7/21/78 Red Sox-Royals game at retrosheet.com, I was surprised to discover that Clint Hurdle had what may well have been his first, last, and only great day in the major leagues, knocking in six runs against an eventual 99-game-winning team. I have absolutely no memory of Clint Hurdle in this game, perhaps because he fades into his customary inconsequentiality next to Wilson, who seemed that day almost like a superhero, especially with his alliterative first and last names that recalled other superhero alter egos such as Peter Parker, Clark Kent, Bruce Banner, and Reed Richards. Willie Wilson. A lightning bolt in white and blue. You are currently browsing the archives for the Willie Wilson category.